Last month, Michael Evans offered five business predictions for 2016 in Forbes. Since he begins with "this coming year may be the most challenging since 2008 to 2010", this sets off warning bells in the minds of many. Michael Evans prediction begins with "2016 holds a lot of challenges for business growth and expansion, and smart CEOs and investors should position themselves for a highly volatile year". : Does this language cause you to pause? 1. Expect gradually increasing interest rates and tougher credit for business. 2. Lower oil prices into mid-year followed by gradual increases in the cost of oil. 3. This will be the year of the mega-merger. 4. It will be a challenging growth year for middle-market companies. 5. It will be politics as usual—and the gap widens! With questions of challenges, mergers and changes in politics... you may be looking more closely at opportunities and challenges. Recently, a Forbes article by Bruce McCain shared thoughts about trends to watch for in 2016. We have already seen the Fed increase interest rates for the first time in almost ten years and while it is a small change, some say "watch for more". By connecting the dots as it relates to geography and the largest companies in each state, we can watch trends of revenue, profit, employment, etc. 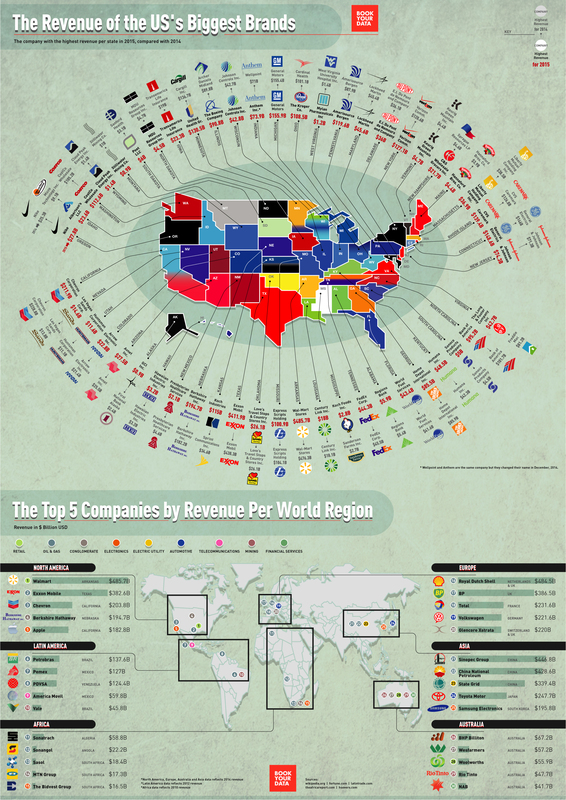 This infographic below breaks down the biggest companies per state by revenue for both 2014 and 2015. Next, the five biggest company by revenue is identified for 6 major world regions. Click on the infographic to enlarge. We can provide mobile workstations, picking carts, POS carts, receiving carts and portable retail carts. With the integrated portable power package, improved productivity is almost "instant".